The past couple of months have turned out to be full of emotional turmoil for World Cricket as well as Indian Cricket with the agonizing news of the demise of Australian cricketer Phillip Hughes and then the shocker of Indian Captain Dhoni's announcement of retirement from the Test arena of cricket. However, it is now time to move on and shift our focus towards the shorter format of the game. With the cricket extravaganza, the ICC World Cup (hosted by Australia And New Zealand) beginning on 14th February this year, this triangular series would be more of a helpful rehearsal for the cricket teams of Australia, England and India in more ways than many. Of the most valuable profits which the three teams will gain from this series, will be getting a feel of the pitches and conditions Down Under as well as getting their combinations of the playing XI fixed and strategies cleared according to those conditions. After losing the Border-Gavaskar trophy to Australia 0-2 India captained by MS Dhoni would be looking to end up on high before the World Cup. Even England which is considered not be that strong a ODI team by experts of the game off late, would look to start on a positive note under the leadership of the new captain Eoin Morgan who can take away the game from the opposition through his explosive batting on any given day. On the other hand Australia under Michael Clarke would be looking to carry forward their winning streak in their own backyard. Having lost their last ODI series again the Sri Lankans 5-2, the Three Lions would try to get things sorted out before the World Cup. They would expect a stable start from their opening batsman and some fire middle order batsman in the likes of Joe Root and Moeen Ali who have been in good form off late. In terms of bowlers, Woakes and Jordan who were the highest wicket takers for England in their last ODI series, would be anticipated to deliver. Eoin Morgan replaces Alastair Cook as the ODI captain for England. India would be looking to find some solace in the area of the much questioned death bowling. Also it would be interesting to know whether the captain goes for the all round medium pacer Stuart Binny or with the all round spinner Axar Patel. With the bat, Virat Kohli who has been in blazing form recently and holds a lot of records to his name while chasing, would be the key. Mention must also be made of Rohit Sharma’s role in this series, who scored a brilliant 264 against the Lankans in the ODIs late last year. Virat Kohli who performed really well in the tri-series in Australia a couple of years ago would be the important man for India. As far as Australia is concerned Shane Watson who has not been in good form would try to save and cement his spot in the side by delivering both with the bat and ball. On top of the order David Warner who is in great form would try and give Australians a flying start. Pat Cummins who returns to the side after a long gap would try and make most out of his comeback series. Even the injury speculations over Clarke and Mitchell Marsh would be in the watch light. 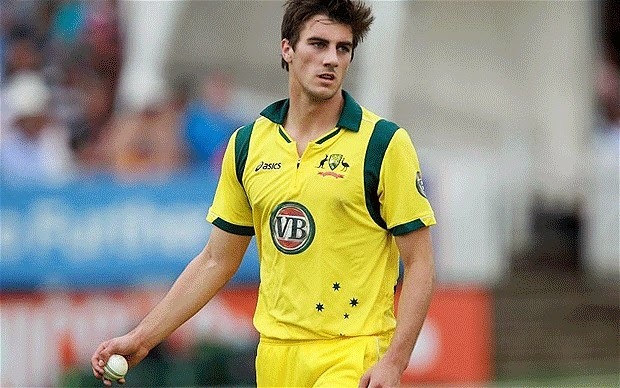 The Australian fast bowler Pat Cummins secures a spot in the side after a long layoff. To sum it up, we would say it would be an exciting series for the fans and also the teams who would try and extract the best out of it. Preview of the Carlton Mid ODI Tri-Series.